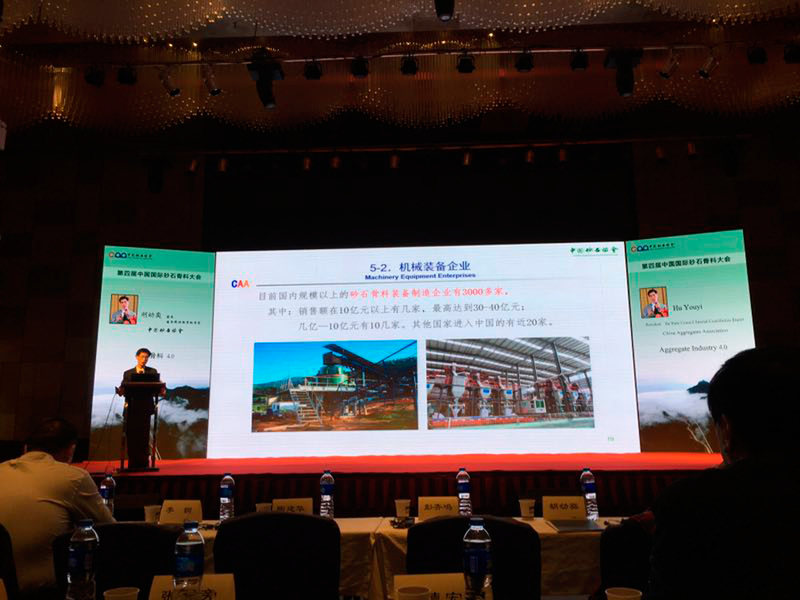 Summary：On December 9th, the 4th China International Aggregates Conference was held in Xuzhou, Jiangsu Province. Themed by "Green, Intelligent Manufacturing, Integration, Sharing", this conference welcomed not only related domestic government leaders, experts and enterprise representatives in aggregate industry, but also some international guests from Britain, South Africa, Spain, Singapore, India and some countries which participate in the "B&R Initiative". After related leaders and guests gave speeches, Mr. Hu, the chairman of China Aggregates Association, gave an address about Aggregates 4.0. 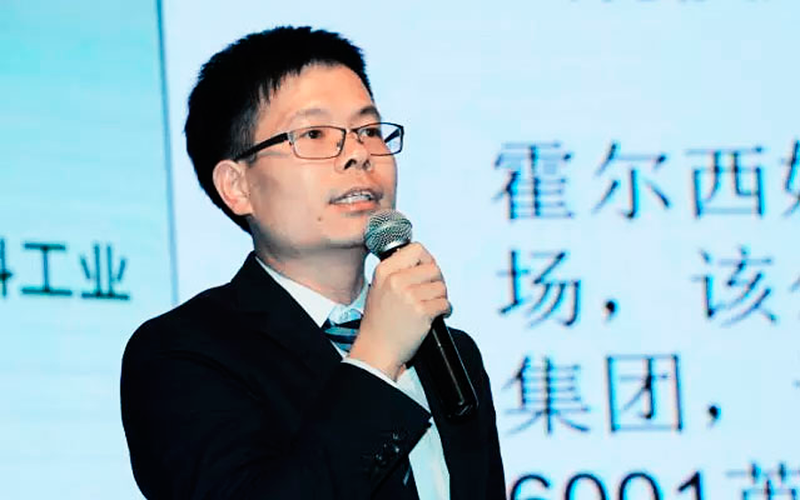 During Mr. Hu's representation, he introduced the achievements got by Chinese aggregates industry on the upgrading and green development in recent years, the newly-established typical eco-friendly modernized aggregates companies, superior aggregates cases in national key projects, recycle of solid wastes, environment recovery of abandoned quarries and domestic aggregates machine manufacturers, etc.. Besides, Mr. Hu spoke highly of our company --- SBM Industry & Technology Group Co., Ltd by pointing out SBM's achievements on the industrial development and machine export. As a domestic prominent aggregates manufacturer, SBM's annual output value amounts to over ￥4 billion. On behalf of SBM, Mr. Fang, the executive vice president, gave a representation called On Aggregates Industry in Big Mining Era. 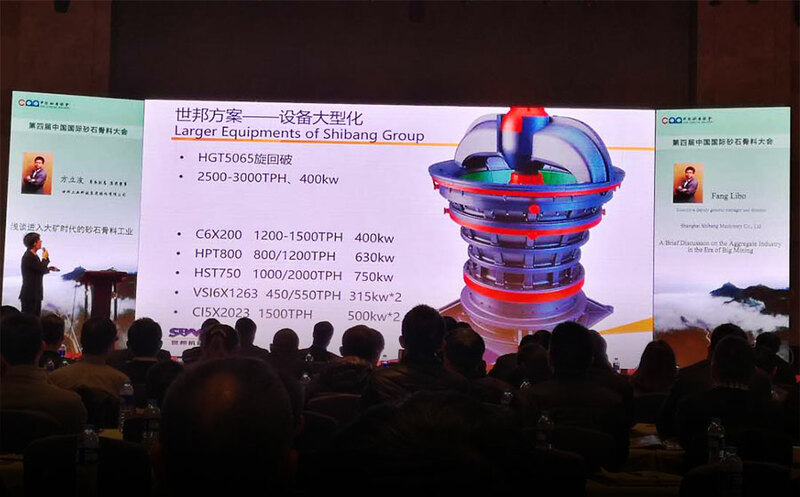 By analyzing development of domestic aggregates industry in recent five years, Mr. Fang discussed with participants over the industrial situations from industrial scale, technologies to equipment. Meanwhile, Mr. Fang revealed what SBM had done in recent years to welcome the big era…. To adapt economic growth, many countries get crazy on infrastructure construction, which makes aggregates supply urgent. Because the natural aggregates like pebble are limited, people throw their eyes to the production of machine-made aggregates. Just as the following picture shows, from 2001 to 2016, the demand for aggregates almost kept rising yearly. In big mining era, SBM actively researches and develops various large facilities with big capacity. Besides, SBM has always been pursing more advanced manufacturing technologies and offering more suitable solutions. To provide more targeted services, SBM established several business divisions successively including jaw crusher division, cone crusher division and solid waste disposal division, etc. Holding the principle of “Customer First”, SBM pushes out the EPC service.